I've Settled on a Kitchen Color Scheme! First, I want to say THANK YOU to everyone who commented about what I should do with my kitchen cabinets! Your feedback was invaluable! So many of you had great suggestions, and I took them to heart. Well, actually.. not white. 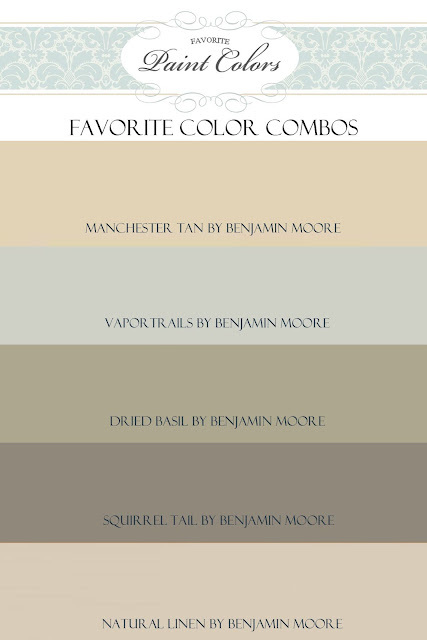 Like Cape on the Corner suggested, I settled on a warmer tone.. Manchester Tan by Benjamin Moore. I know it seems really dark, but I have lived with the paint sample taped up to my counter for more than a year.. Against my granite and dark island it doesn't read like a dark tan.. In my previous inspiration post I mentioned that I was in LOVE with pencil tile backsplashes. I knew it was fate when I found this tile at, of all places, Costco! With my coupon it worked out to only $4/square foot! That is a great deal for pencil tile! This same tile is $15/square foot at Home Depot! It is starting to look a lot like my inspiration photo isn't it? I also am taking the advice from Jule and Zefi and am going to open up a few of the cabinets, by taking off the doors and creating some open shelving. I love the look of the cabinet in the upper left of this photo. I think I can knock off the look with some molding and beadboard. Everything is falling into place! I am getting started immediately! I really like the color you have picked. I want a lighter color in my kitchen but it is very dusty here so I am not sure white is a great choice but now I am thinking about your tan. I have the same granite with tumbled marble backsplash. I will the watching to see how it turns out for you. Thank you so much for sharing. I love it! Its going to look wonderful! 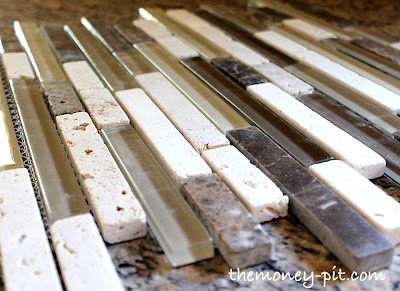 My sister got those same exact backsplash tiles from Costco for her newly updated kitchen too! They will look fantastic for sure. I agree with opening a few of the cupboards. I did the same when I painted my cabinets and it gives it a more custom feel. Can't wait to see it! I'm sure you'll get it done a lot quicker than I did mine;)....only a year of off and on again;). typical me. Go YOU! I really love that kitchen with the yellow cabinets too. 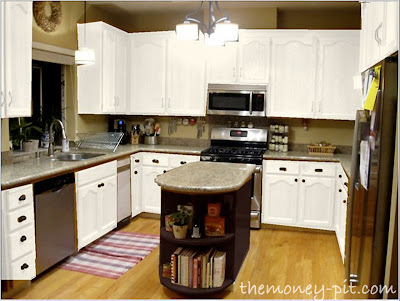 You are going to love your new kitchen and I can't wait to see the transformation. I love a good deal!!! Great job on finding stuff on sale or for less than retail!!! I love the choices you're taking, Kim!! Those tiles look great! and for that price, what a find!! I'll be checking all your progress, I love your work! That's way I nominated you for the Versatile Bloggers Award! thanks for the shout out, you rock! it is looking sooo good in here with those plans, and who woulda thunk costco! i have got to get me a membership! 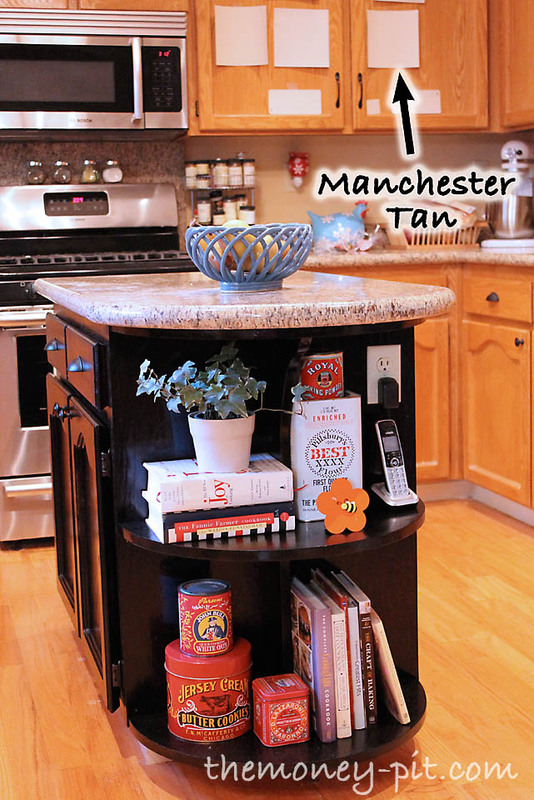 Manchester Tan is one of my all time favs. It works everywhere and is never boring beige. 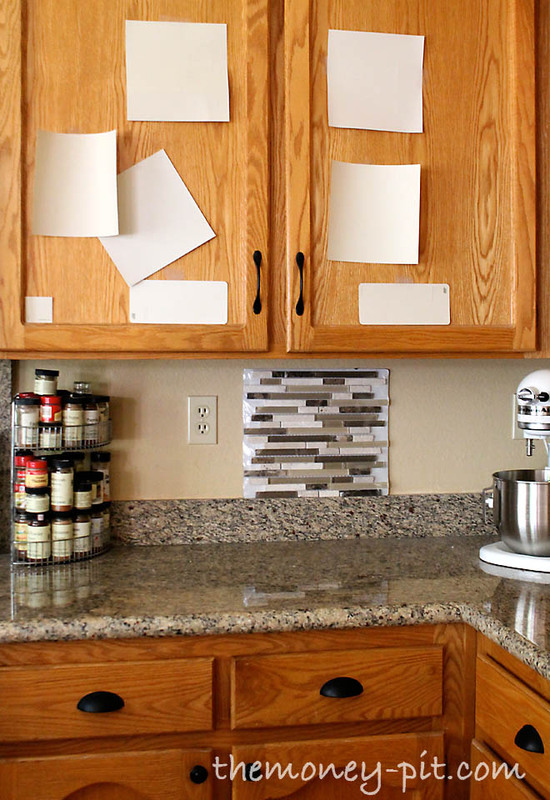 This is a very exciting kitchen makeover! I love the pencil tile too! it's going to look great! cant wait to see the after photos! P.S. I wanted to kick some of those people over on hometalk with their negative comments, just now. we have taken down 3 doors...back then when open shelving was not cool... yet! our cabinet color is a light creamy yellowish color...I think your choice of color looks great with the pencil tiles and the counters! Great choices! Can't wait to see it! I'm so excited for you and I couldn't help but smile as I scrolled through your choices. Our family kitchen growing up was all wood and my current adult kitchen is white. I personally like the light, airy feeling of a lighter room. Can't wait to see the finished product! Your kitchen is going to be beautiful. I'm looking forward to seeing it finished. Probably not as much as you are though! Enjoy it and be patient through the work. Looks like you're going to end up with a beautiful kitchen! I hopped over from Debbiedoo's party. Love your blog and your center island. Have to say I think I have that kitchen faucet in our house and not happy with it. The house was built a year ago and my problem with the faucet is it gets water on the granite all.the.time! I had a plumber check it, tighten it, etc. Plumber said it's correctly installed and apparently that model just gets water on the counter easily. Just 2 cents worth here. But you might check out if there's any other feedback on it. Can you direct me to the link that shows how you painted your cabinets? Love this kitchen! Totally inspired! What color are your walls?